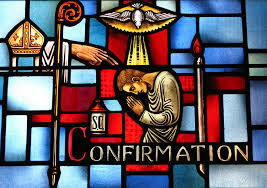 ​Through the sacrament of Confirmation we receive the gifts of the Holy Spirit and renew our baptismal promises. One also becomes more aware of the presence of the Holy Spirit through the anointing of chrism oil and the laying of hands by the Bishop. Confirmation enriches the baptized with the Holy Spirit such that we commit to living a life of maturity in the Christian faith. The Catechism of the Catholic Church says, “Every baptized person not yet confirmed can and should receive the sacrament of Confirmation. Since Baptism, Confirmation, and Eucharist form a unity, it follows that "the faithful are obliged to receive this sacrament at the appropriate time." For without Confirmation and Eucharist, Baptism is certainly valid and efficacious, but Christian initiation remains incomplete. Preparation for Confirmation here at Immaculate Heart of Mary Church is a two-year formation process. The formation process includes classes, spiritual formation and parish involvement including retreats and community service hours. Each candidate must also select a Sponsor(s) to stand with them on Confirmation Day. For more information please contact Mary Salas at (210)445-6150. * Cannot be the father or the mother of the child. El Catecismo de la Iglesia Católica dice, " Cada persona bautizada que no está confirmada puede y debe recibir el sacramento de Confirmación. Puesto que el Bautismo, la Confirmación y la Eucaristía forman una unidad, por consiguiente "los fieles tienen la obligación de recibir este sacramento en el tiempo adecuado." Sin la Confirmación y la Eucaristía el Bautismo es ciertamente valido y eficaz, pero la iniciación Cristiana queda incompleta. * Se requiere de un padrino o madrina, pero si se elijen dos, solo puede ser un hombre y una mujer. * Deben tener los sacramentos de Bautismo, Primera Comunión y Confirmación y llevar una vida en armonía con la fe Católica. * Si son casados, deben estar casados por la Iglesia Católica.